I use AnyDVD, CloneDVD2 and Nero. 100% successful all the time! AnyDVD – This is used to remove the Copy Protection and the Region codes etc. First we will check some of the basic settings. After installing and starting AnyDVD you will have a little red fox face sitting down on in the system tray. Right Click the AnyDVD Red Fox Face (Shown above) and choose Settings. 2. Navigation: Tick ‘Remove annoying adverts and trailers’. 3. Feature Removal: TICK them all. TICK ‘Remove CD Digital Audio Protection’. 2. Tick ‘Enable Speed Control’. 2. Tick ‘Enable any DVD’. That is all you need to do to setup AnyDVD so you can now click OK! Now when you want to backup a DVD Movie all you need to do is start AnyDVD so you see the red fox face in the system tray. AnyDVD is now ready for you to insert you DVD Movie. NOTE: Always start AnyDVD before inserting the DVD Movie!! Last edited by Grumpy; 25-03-2011 at 04:41. CloneDVD2 – This will read the DVD Movie. Step 1: Refer to above Picture. Step 2: Refer to above Picture. 1. Use the little drop down arrow and choose the DVD drive which holds your movie. 2. Notice how only the main movie title is ticked! 3. Notice at this stage it is saying that our quality will be 82%. Anywhere in the green area of the quality bar is very good quality!! Step 3: Refer to above Picture. In this picture you will notice we only have the one Audio Stream ticked and the one Audio Channel. We don’t want subtitles so its not ticked! Step 4: Refer to above Picture. 1. Choose your preferred Read speed. I ALWAYS use 4x!! 2. Choose your DVD Writer. 3. The DVD Label. Most times I just leave this as the default! 4. Choose where you would like to save the files. NOTE: I always name the Save folder the same as the DVD Volume Label!! This is so I remember the correct Label when I write the DVD later! 5. THE IMPORTANT PART!! UNTICK THE BOX!! CloneDVD2 will now read your Movie DVD. It will take approximately 12-15 minutes at 4x. Step 5: Refer to above Picture. When the reading has completed the DVD will eject and you will be prompted to insert a recordable media into the drive. That is the disc read completed. Now to write our movie! Last edited by Grumpy; 25-03-2011 at 04:43. Nero – This will write our DVD files to our Blank DVD. Insert a Blank DVD into your DVD Drive!! 1. 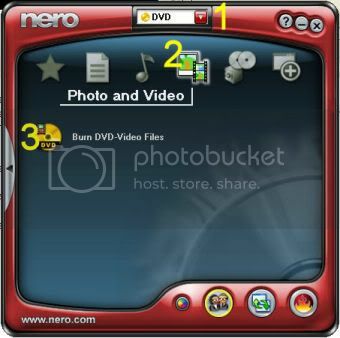 Open Nero and use the drop down arrow to choose DVD. 2. Choose ‘Photo and Video’. 3. Click on ‘Burn DVD-Video Files’. Step 2: Refer to Picture below. 1. Change to the DVD Recorder. 2. Browse to where you saved your DVD files. 3. Label the disc the same as the original. NOTE: Remember we named our folder the same as the original DVD! So just click on the folder (number 2) and copy the text, then paste it in for the label. (number 3). 4. Open the ‘Edit’ menu and choose ‘Select All’. This will highlite all our files. 6. The files will now show up in the column where you just dropped the files. 7. The blue bar will now show up to let you know how much of the Blank DVD will be used. All there is to do now is to check the write speed, (I always use 4x) and click the ‘Burn’ button. The writing should take approximately 12-15 minutes at 4x. Last edited by Grumpy; 25-03-2011 at 04:32. AnyDvd & CloneDvd rock. Thats how I copy about 95% of my movies. Nice work Grumpy, just curious though, why dont you burn the files with Clonedvd2?? Have you had problems burning with it in the past? try anydvd and vobblanker programs and you should have no problems on any movie. or use dvd fab decrypter with vobblannker. Life is just a dream that you can not wake up from. All I need, is my Dugout full of weed. hey grumpy on your guide there where u say to do this 4. Open the ‘Edit’ menu and choose ‘Select All’. This will highlite all our files. just curious though, why dont you burn the files with Clonedvd2?? Have you had problems burning with it in the past? Yes I used to have a few problems with CloneDVD2 when doing the actual burn. The burn would sometimes stop halfway thru and complain about the media? But I really believe it was only caused by the cheap media I used to use. But since doing the burn with Nero (even with the cheaper media) I have never had a problem with any movies. They all play in any standalone player. Yes that will also work. I wrote it my way only to try and explain where the files actually end up. I wanted people to realize what files went where. But thanks all the same for you tip. Grumpy I am going threw your prosses of copying a movie using your instrucutions When i pull up nero on step 1 (3.) I dont have a burn dvd-video files tab what do I do ???? I've noticed this alot in the past with just about any blank media. It happens more often when backing up original DVD's that have episodes on them. Burning the movie with Nero 7 from a CloneDVD2 shrunken file on your harddrive increases the chances of a good burn by alot. What version of Nero are you using? 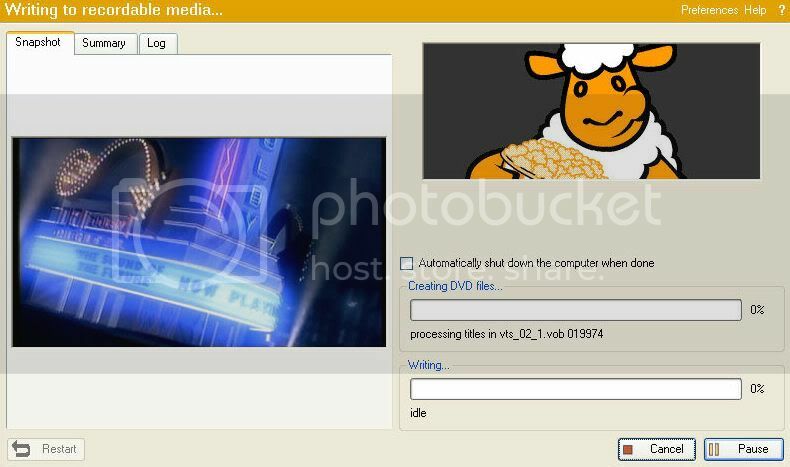 Nero 7 Ultra version 7.0.5.4. , and the latest version of CloneDVD2 and AnyDVD. Yes the questions was actually to tontosmudflap! And no I havent updated Nero yet. I never update until I am sure the newer versions are as reliable as the previous versions. Not always is the latest the greatest.